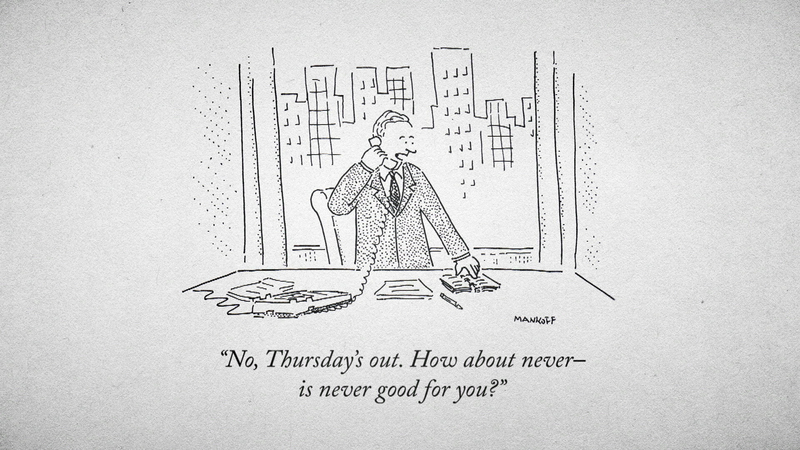 A Bob Mankoff NEW YORKER cartoon. Photo: Kristen Johnson. Courtesy HBO. Yes, Very Semi-Serious is long and has an equally long-winded title…both of which (the length and the title) could use some tweaking. But the film’s primary goal–to provide a “partially thorough portrait”of the cartoonists who continue to submit their work to the venerable 90-year-old magazine–is more than adequately realized. Esteemed cartoonist and cartoon editor at THE NEW YORKER, Bob Mankoff, is featured in VERY SEMI-SERIOUS. Photo: Kristi Fitts. Courtesy HBO. The film zeroes in on the magazine’s weekly rigorous cartoon selection process–approximately 15 cartoons out of thousands of submissions are published in every issue. Helmed by longtime cartoon editor Bob Mankoff, the Tuesday ritual plays out much like open auditions for stage and screen, humanized by Mankoff’s predilection to be both mentor and psychoanalyst as well. 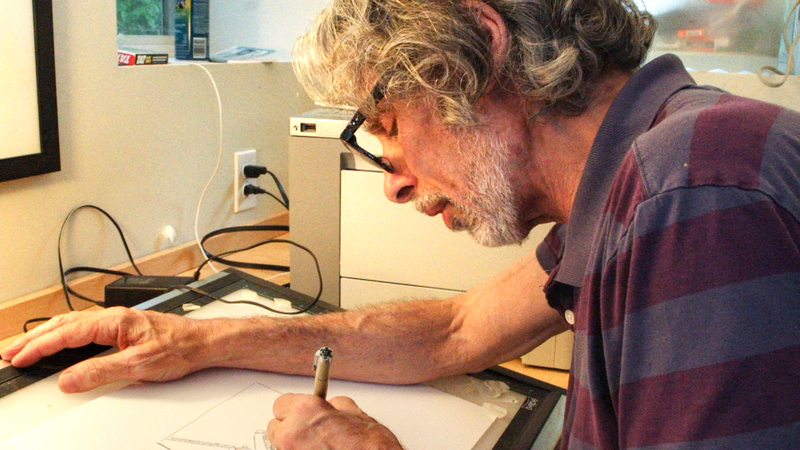 Mankoff, a prolific cartoonist in his own right (more than 900 of his cartoons have been published in The New Yorker since the 1970s), meets one-on-one with hopeful veteran and newbie New Yorker cartoonists and sifts through and comments upon their latest submissions. This process requires a thick skin, especially from newcomers, since Mankoff is not one to mince words…for better or worse. On a positive note, he also is quick to chuckle or laugh out loud and offer sincere encouragement and solid direction where needed. THE NEW YORKER published this George Booth cartoon immediately after 9/11. Courtesy HBO. 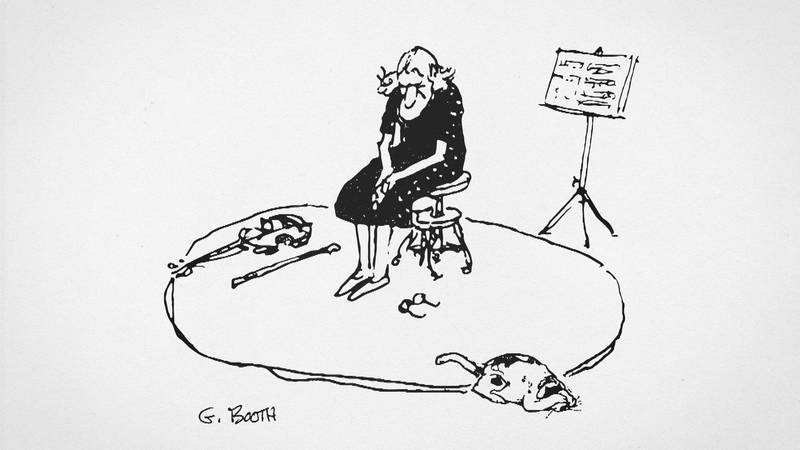 Veteran New Yorker cartoonists still in play have a quick shot in Very Semi-Serious to fill in their back stories, including 89-year-old George Booth, Mort Gerberg and Roz Chast. The latter recalls her unlikely evolution as a cartoonist and equally uncomfortable introduction to The New Yorker’s male inner circle. There is a nod to the legendary talents of Charles Addams, William Steig, Peter Arno and James Thurber. And special focus is on the aspirations and psychological profiles of young people who show up week after week with new cartoons in hand and walk away with Bob Mankoff’s yea or nay. Woven throughout Very Semi-Serious are personal vignettes profiling Mankoff himself. While these sequences would fit comfortably in a bio about Mankoff, they are off-point and distracting in this film. 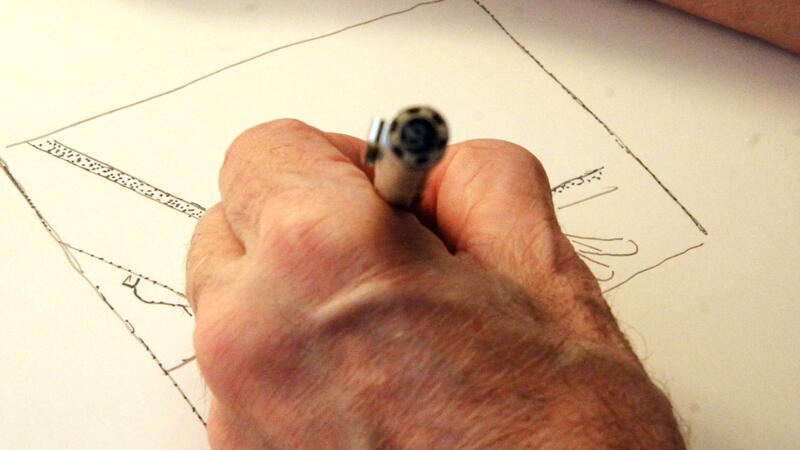 Artists and illustrators, especially budding or established cartoonists, will find Very Semi-Serious to be especially informative and enlightening, as will avid fans of New Yorker cartoons in general. For those new to the magazine’s editorial or those fascinated by its history, more needed to be said in this film or needs to be said in subsequent films about the legendary cartoons and cartoonists who have graced and continue to grace its pages. This entry was posted in Art, Cable, Film, Magazines, Publishing and tagged Bob Mankoff, Cartoons and Cartoonists, Charles Addams, David Remnick, Davina Pardo, George Booth, Leah Wolchok, Mort Gerberg, Peter Arno, Roz Chast, The New Yorker, Very Semi-Serious, Vintage Cartoons. Bookmark the permalink. I thought you’d be writing about this doc. I was glad when I saw an ad that announced tonight’s air date, because the film only played a week at Lincoln Plaza Cinemas a few weeks ago. We’ll be watching tonight for sure.